Mikulas Kravjansky is internationally known artist, now living in Canada, Ontario. Born in Czechoslovakia in 1928 where he studied art and scenography at the Academy of Muses Art. He was a chairman of the art department of the State Television and created numerous designs for operas, ballets and theatrical productions. He was residing in Canada, Florida and California, where he had his own art publishing company, creating and printing limited editions of graphic art. 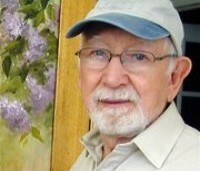 Now he is back in Canada and living at the shores of Georgian Bay, where, in his studio, he is painting pictures, writing poetry and cookbooks.